What is Arundhati Roy’s problem, “truth”? Colin Todhunter writes in column titled ” Looking In The Mirror, Living In Denial: The Arundhati Roy Effect” in Countercurrents.org about problems with Arundhati Roy, that her critics acknowledges the fact that what she says and writes the true motives and intent underlying official policies. That, she is a Malayali/Bengali and it has always been fashionable to take an opposing view and that she is merely playing to a western media that are always looking to paint the India in a poor light. Arundhati Roy’s recent 6,000 word article in India’s Outlook magazine in March contained a wide ranging critique of US foreign policy, capitalism, imperialism, globalisation, India’s industrialisation and the nation’s various internal conflicts and numerous other matters. All the things she has become noted for. Predictably, it provoked the kind of personal attacks that Roy has become accustomed to. You either agree with Roy’s overall analysis, or at least parts of it, or you do not, and it’s always interesting to read critiques of Roy’s stance based on logical argument. Those who try to counter Roy in this way at least respect her views enough to spend time critiquing them. There are many, however, who like to leave logic aside and concentrate on Roy the person, stridently attacking her motives, psychology and personality. What is it about Roy that elicits such bitter reactions, especially from within India and particularly in upper middle class circles? Such responses confuse personal prejudice, character assassination and sniping with critical analysis. Notwithstanding that no one can ever be right all of the time, it could well be that there is nevertheless a good deal of truth in what Roy says on various matters, and perhaps that’s the problem. If her arguments are too black and white then show it. If she leaves little room for nuance then discuss it. If she is playing fast and loose with facts, challenge her. Instead, what we too often have are outbursts that have little to do with the issues themselves, but with Roy and what some consider her to be. There are the accusations that say she merely plays to a western audience that buys her books, she is a self publicist or that her writings display some sort of personality deficit in terms of her constant attention seeking. While it may well be the case that there is a certain underlying misogyny inherent in some of the personal attacks, the question remains as to why do so many ordinary people in middle class households get so fired up over her. Anti-establishment figures in all countries have always been vilified by newspapers, TV channels, politicians and opinion leaders. And ordinary folk often follow suit. Noam Chomsky experiences it in the US and journalist John Pilger has also had to bear similar establishment backed wrath in the UK. Roy is as terribly anti-India as Chomsky is as single-mindedly anti-US, so the warped line of reasoning from officialdom and its cheer leaders goes. Most of the time, the writings of such figures delve beneath the rhetoric and propaganda to highlight the true motives and intent underlying official policies. Their arguments, however, too often become buried beneath personal criticisms and smear campaigns which set out to undermine them as people and by proxy their analyses. Why deal with uncomplicated truths that challenge officialdom when they can be brushed aside or attention can be diverted from them with abuse? As far as Roy is concerned, the smears against her take many forms. She has writer’s block, so she seeks the limelight by jumping on the latest cause celebre. She’s not an expert – others in a given field have been working for a cause for decades and never get the column inches she gets. She is Malayali/Bengali and it has always been fashionable to take an opposing view. She is merely playing to a western media that are always looking to paint the India in a poor light. And don’t forget that she doesn’t really understand the plight of the poor or oppressed. How could she choke on the stench of poverty or oppression with such a big silver spoon filling her mouth? India doesn’t need Roy to tell us what we already know, does it? We don’t need such a celebrity activist with prosaic writing to tell us how to put things right? India has thousands of hands on community activists and workers who are making a real difference every day. Such is logic of the anti-Roy brigade. Looking at onself in the mirror can be a painful process, especially when the mirror is, like India, not as shiny as you were led to believe. Roy holds up the mirror and forces people to look. It is then that the gap between the poor and violently oppressed and the self congratulatory ‘new’ India of AC shopping malls, gated communities and all manner of conspicuous displays of luxury which the Indian upper middle classes cherish so much becomes too unbearable to accept. So what better response than denial? What better reaction than to vilify the messenger? Could it be that Roy makes many feel too insecure? Could it possibly be that living in denial helps suppress the guilt that would gush forth if people were to acknowledge that a terrible price is being paid for an urban-chic lifestyle built on squeezing the life out of much of India via population displacement, land grabs, highly exploited labour, environmental degradation and state backed violence? You don’t have to be living in the gutter before you are allowed to express a valid opinion on poverty or oppression. And if you have a message, it would be foolish not to use your talent to reach out to as wide an audience as possible. But maybe that’s part of the problem. For some, holding up a mirror to Indian society is bad enough, but Roy has the ability to project a realistic yet unpalatable image of India across the globe. With all their new found wealth, that’s what seems to annoy her critics most. When you strike at a raw nerve, unthinking, knee jerk reactions usually follow. Colin Todhunter : Originally from the northwest of England, writer Colin Todhunter has spent many years in India. He has written extensively for the Deccan Herald (the Bangalore-based broadsheet), New Indian Express and Morning Star (Britain). His articles have on occasion also appeared in the Kathmandu Post, Rising Nepal, Gulf News, North East Times (India), State Times (India), Meghalaya Guardian, Indian Express and Southern Times (Africa). Various other publications have carried his work too, including the London Progressive Journal and Kisan Ki Awaaz (India’s national farmers’ magazine). A former social policy researcher, Colin has been published in the peer-reviewed journals Disability and Society and Social Research Update, and one of his articles appears in the book The A-Z of Social Research (Sage, 2003). Man-made Suncream may block the body's natural defence against UV rays. Suncream may actually block the body’s natural defence against harmful UV rays, a surprising new study has found. Scientists from Brown University, UK have discovered that human skin contains sensors that detect radiation from the sun. These light receptors – which are also found in the retina of the eye – immediately, prompt the release of melanin, the body’s own form of sun protection. This is likely to provide rapid protection against UV damage, long before the skin starts to tan. Researchers now believe that full sunscreen blockage is not necessarily good in sun creams because they block certain wavelengths of light needed to trigger the body’s natural defences. It is hoped that the findings, published in the journal Current Biology, will help pharmaceutical companies to develop more effective products. The findings say that there was no prior evidence that those receptors can function in skin. The study shows that a dedicated UV receptor allows skin cells to immediately detect and respond to UV light. This protective capacity should be taken into consideration in the design and use of broad-spectrum sunscreens. During the study human skin was exposed to light at different wavelengths. Results revealed that the light receptors, called rhodopsin, became most active under blue and UV light, prompting melanin production within seconds. 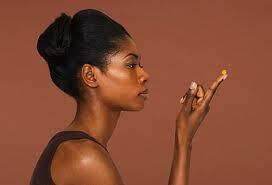 Melanin is a pigment that absorbs harmful ultra violet rays to help protect the skin, as well as turning skin darker. This helps prevents the damage responsible for the formation of malignant melanoma and other skin cancers. The research further found that human skin detects light using a mechanism similar to that used by the retina, on a timescale significantly faster than was previously known. Both the eye and skin – the only two organs constantly exposed to solar radiation – use similar molecular mechanisms to decode light. There are a number of ways that you can prevent sunburn and stay safe while in the sun. Seek advice immediately from your GP if you notice changes to any of your moles – for example, a change in their size, colour or texture. Many people could live to the age of 100 by following seven simple steps, according to a leading heart doctor. Changes to lifestyle such as keeping a healthy weight, not smoking and controlling your cholesterol levels are an easy way to add an extra decade or more to your life span. 90 per cent of people could live to the age of 90 and even reach 100 by following below mentioned seven easy advice. The other steps are regulating blood pressure, managing diabetes, eating a healthy diet and getting active. Achieving these seven simple lifestyle factors gives people a 90 per cent chance of living to the age of 90 or 100, free of not only heart disease and stroke but from a number of other chronic illnesses including cancer. 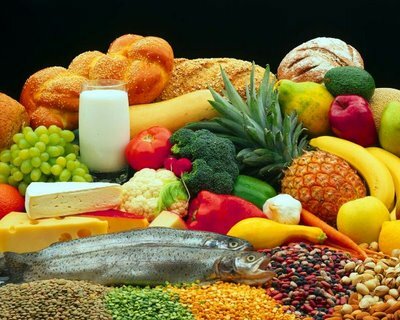 The advantage of all these could be that the risk of early death will be reduced by controlling high blood pressure, which is known as the ‘silent killer’ because it has no symptoms. 1. 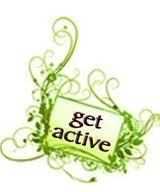 GET ACTIVE: Inactivity can shave almost four years off a person’s expected lifespan. People who are physically inactive are twice as likely to be at risk for heart disease or stroke. 2. KNOW AND CONTROL CHOLESTEROL LEVELS: High blood cholesterol can lead to the build up of fatty deposits in your arteries – increasing your risk for heart disease and stroke. 4. KNOW AND CONTROL BLOOD PRESSURE: High blood pressure is often called a ‘silent killer’ because it has no warning signs or symptoms. By knowing and controlling your blood pressure, you can cut your risk of stroke by up to 40 per cent and the risk of heart attack by up to 25 per cent. 5. ACHIEVE AND MAINTAIN A HEALTHY WEIGHT: either overweight or obese − major risk factors for heart disease and stroke. Being obese can reduce your life span by almost four years. 7. BE TOBACCO FREE: Half of all long-term smokers die early from smoking-related diseases, including heart disease, lung cancer and chronic bronchitis. As soon as you become smoke-free, your risk of heart disease and stroke begins to decrease. After 15 years, your risk will be nearly that of a non-smoker. More harm than good? 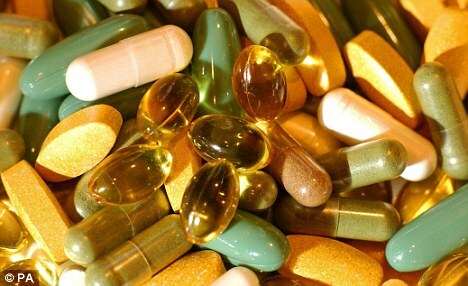 Multi-Vitamin pills can cause premature death !!! More harm than good? Vitamin pills can cause premature death. Vitamins and other food supplements taken by millions of women may actually put them at more risk, according to a major study. Scientists say there is little evidence the pills do any good – and in fact some could be causing serious harm. A study involving nearly 39,000 women has found multivitamins, vitamin B, folic acid, iron, magnesium and copper all increased the statistical risk of premature death. Some of the most popular pills include multivitamins, vitamin A, C and E, iron, folic acid and calcium – which are all thought to improve long-term health and ward off illnesses. Scientists from Finland, Norway, the U.S. and South Korea looked at the long-term health effects of common vitamin pills and minerals on 38,772 women aged 55 to 69. Over an 18-year period the women recorded any supplements they regularly took. The results, published in the Archives of Internal Medicine, found copper increased the risk of dying prematurely by 18 per cent. Folic acid – which pregnant women are told to take to protect their child against spina bifida – increased risk of death by almost 6 per cent, while iron raised the risk by nearly 4 per cent. 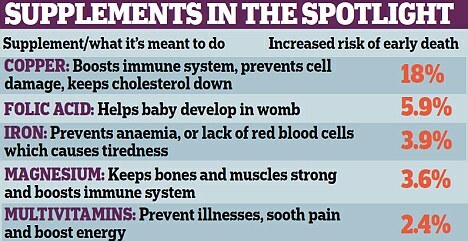 Multivitamins raised the risk by 2.4 per cent, vitamin B6 by 4 per cent, magnesium by 3.6 per cent and zinc by 3 per cent. The scientists do not fully understand how supplements may trigger early death, but they may interfere with the body’s natural defences. They say the supplements should only be taken by patients who are malnourished and only under the supervision of a doctor. Everyone else should ensure they eat a balanced diet to get adequate vitamins and minerals. Jaakko Mursu, from the University of Eastern Finland, said: ‘Based on existing evidence, we see little justification for the general and widespread use of dietary supplements. The results back up a major Danish study carried out at the University of Copenhagen in 2008 which found some vitamin supplements increase the risk of dying early by 16 per cent. Last night experts dismissed the latest findings. They claimed many patients took supplements to treat underlying health problems – for example iron for anaemia – so were more likely to die early anyway. Dr Carrie Ruxton, from the Health Supplements Information Service, which provides the public with information on vitamins and minerals, said: ‘Multivitamin supplements contain a variety of essential vitamins and minerals which help those with less healthy, or irregular diets, to meet recommended intakes of nutrients, thus ensuring the maintenance of normal health and well-being. ‘The findings should be treated with extreme caution given the poor methodology and lack of reliable information about the health of participants, or the type of diets consumed.